Eviction Notice is a thoroughly enjoyable book with non-stop action and more than its fair share of laughs. The author takes on what I consider some of the most difficult writing: humor. But where other more established writers have stumbled, Mr. Wyrick succeeds with flying colors. While I do see a bit of Joseph Heller with a side of Terry Pratchert in his work, he still has his own unique and satisfying voice. The story starts with the Ogden, Iowa, senior class prank, a school tradition where each graduating class tries to outdo the previous one. When the pranksters decide to create a crop circle in a corn field, they never realize that they have put into motion a misplaced delivery of a Glen Fairy, a being in tune with nature and with the ability to heal the abuses heaped up on it by the various beings in the universe. The Glen Fairy was sold to the pig-like Zorgon as part of the deal to end a war, and Aloon Zigilbraxis was given the task of abducting and delivering her. Unfortunately for Aloon, the Iowa crop circle was a mirror for the actual crop circle he was using as a beacon to have the Glen Fairy brought to him, and the delivery pod brought the fairy to Ogden. Without the Fairy, he is told by Galactic Councilwoman Fry that in the subsection of his contract (which he never read), the penalty for non-delivery is death. Luckily for him, there is a clause that allows a grace period to recover the Glen Fairy. Unluckily for the people of earth, he has to put down collateral for this grace period, and out of options, he claims the earth itself and puts that up as the collateral. The fact that there are some 6 billion people and untold other lifeforms already inhabiting the earth doesn't seem to give anyone pause. All life on earth will just be "evicted" to the vacuum of space. To ensure the legality of all of this, Councilwoman Fry sends two investigators, Clayton, a sympathetic human-looking man, and Tyler, an eight-foot tall, four-armed, heavily-fanged Wolzon Strangle Beast who is partial to well-tailored suits. They approach Alice Able, a woman who is about to commit suicide, because she is from Iowa, where the presidential campaigns begin, and as she was first on a list of registered voters, they assumed she had to be the leader of the world. Without "paperwork" that shows that humans own the world, there isn't much the investigators can do. Time is running out, and with Aloon and a squadron of Zorgon running rampant over Iowa trying to find the Glen Fairy, and with Councilwoman Fry just itching to begin the eviction, there doesn't seem like there is much that Alice, Deputy Johnny Crebs, a handful of students, and Aria, the Glen Fairy in question, can do to save the the people of earth. If none of that makes much sense, it doesn't matter. This is one of those stories that grabs a reader and yanks him or her into the story, never letting go. The wordsmithing is outstanding, the storyline enthralling, and the characterization compelling. Even when the action is at its most outlandish, instead of taking issue as too being far-fetched, I had to nod with an "Oh, that is so true!" One thing I really liked about the humor in the book was that it was blatant and funny but not pie-in-the-face. There were no "ta-da" moments where the author stepped back as if he had just presented a one-liner at a comedy club. The humor flowed seamlessly along with the storyline. It wasn't just the humor, though, that made this a good book. While I continually laughed out loud as I read it, the storyline was not merely a platform to support the humor. The storyline held its own. I love this book, and I think the author is a talent. I will look forward to anything else he writes in the future. 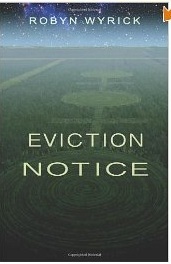 For more reviews or to buy Eviction Notice from Amazon.com, click here.